It takes time, energy and motivation to study. And these three things rarely coincide together. For example, children have a lot of time and energy but little motivation. Students have both motivation and energy, but little time. Adults can have much motivation but can often lack the energy and time. That is why there are few teaching methods that are universal. Flash cards is one of them. A flash card narrows the field of concentration down to a minimum: unfamiliar on one side and familiar on the other. Nothing superfluous! Thus, the establishment of connections in the brain occurs quickly, without any distractions. Unlike book pages, flash cards can be sorted. And if you sort the cards into small groups, you will have enough energy for the whole session. The best motivation is a vital necessity: child development, new friends, work, etc. But the flash cards also involve laziness and curiosity. ◦ The flipping* requires physical effort, albeit insignificant. And laziness subconsciously motivates you to remember what you need to remove the need to keep flipping over the flash card. ◦ And when you see on the back what you expected, the brain receives a small dose of dopamine. with flash cards you will remember it very quickly. How? Simply create your own cards and flip through them every time you have a free 5–10 minutes. Flash cards stimulate thinking, train memory and expand your vocabulary. These are long-known facts. But there is one problem: paper flash cards are not very convenient to use in the fast paced modern life. You can not always buy ready-made paper flash cards for a desired topic. And it’s not as effective for learning as creating your own flash cards. As for creating flash cards you will need, at the very least, paper, scissors and a pencil, and then somewhere to store them. And they are not even interactive. Create and use flash cards on your iPhone® or iPad®. The minimalistic, flexible, and powerful Flashcards · app is so straightforward you’ll be able to use it right away. Learning a new language? Getting ready for your exams? Create your own beautiful flash cards to boost your knowledge. Take a photo or add some text… and Voilà ! Personalize your flash cards! You’ll learn faster and remember more. Learn everywhere: at home, on your commute, or even on a boring date. Only you know what works best for you, so create your own workflow. 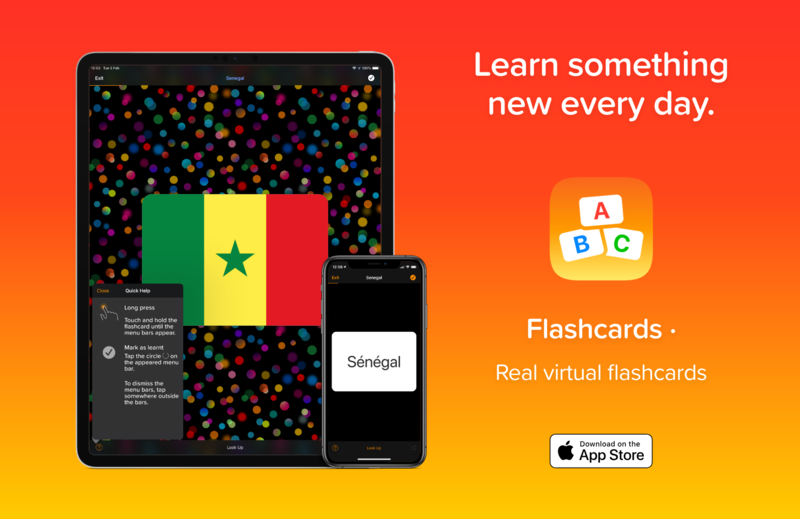 Share your flash cards with friends or with the whole world! Add albums from the Files app without leaving the Flashcards · app. Import text data from the CSV format. 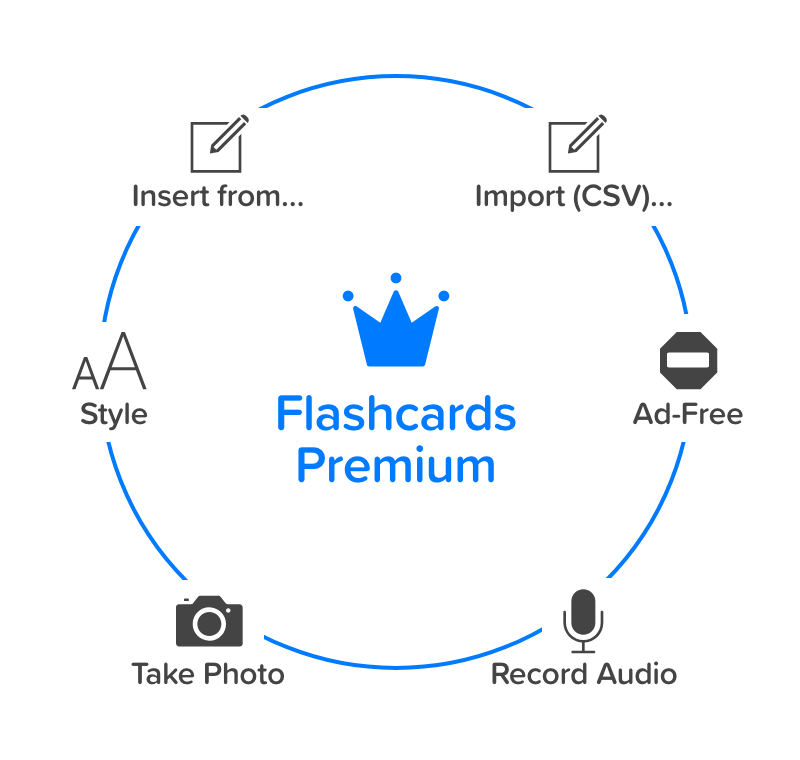 Take photos and record audio right inside the Flashcards · app. Change the size and colour of your text. Enjoy an Ad-free learning experience! 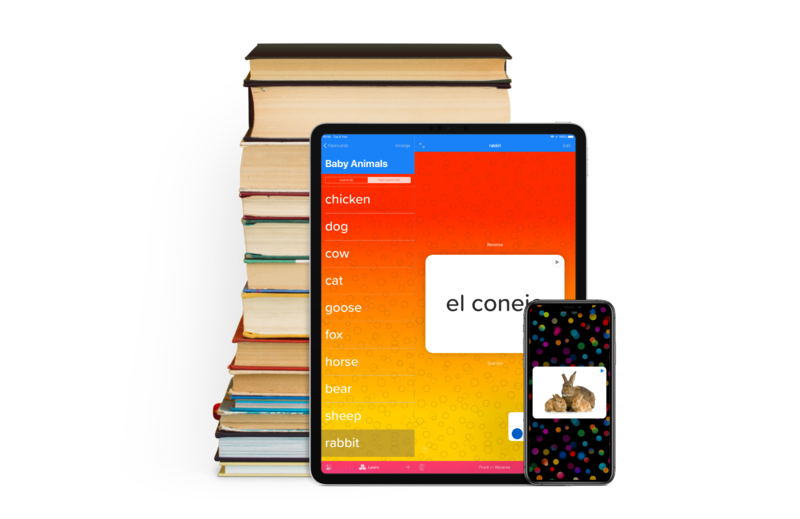 Create flash cards using photos and simple words. Add personalized voice audios to help with pronunciation! Arrange flash cards in any order you like to aid your child’s learning. Study the words with your child every day and mark their progress with simple check marks. Share your flash cards with other parents or with the whole world! Parental Gates disable the editing of flash cards. Children can edit flash cards only by answering the Parental Gates question. Children can always 1) create flash cards, 2) study them, 3) mark flash cards as learnt and sort them. Engaging and fun — they won’t want to stop! The Vivid Theme changes the look and feel of the app. So that children will have more fun when they learn new words and concepts. And you will too! 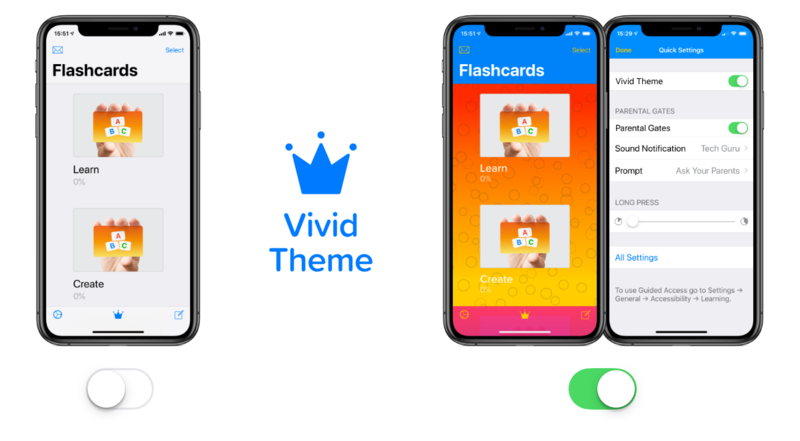 After purchasing the Vivid Theme, the Quick Settings panel is activated to conveniently manage all the parameters of the Flashcards · app that are related to children. * Quick card flipping — that one flash from which the word ‘flashcard’ comes from. Incidentally, they are sometimes called ‘learning cards’, ‘Doman’s cards’, ‘word cards’ or ‘picture cards’. Apple, the Apple logo, iPhone and iPad are trademarks of Apple Inc., registered in the U.S. and other countries. App Store is a service mark of Apple Inc. Requires iOS 11 or later.